The flight system consists of a latex meteorological atmosphere sounding balloon, designed to burst at a particular altitude, a woven nylon load line connected to the parachute, and the payload - an environmentally rugged case containing avionics, communication systems, cameras and experiments. High altitude (also called Near Space - somewhat boastfully, as the altitudes reached are halfway into space :-) conditions are quite forbidding and demands placed at the flight system, especially the avionics, are high. Temperature spans from +30°C on the ground to -60°C at 30km, air pressure is nearly zero, the sky is completely black and you can see Earth's curvature. The whole payload spins and swings, especially after the balloon bursts. The landing can be hard if the shroud lines get coiled or if the flight recovers on a cement sidewalk. Everything has to be robust and light at the same time, as weight costs altitude - not to mention the regulations, which are pretty strict. I had to decide what i wanted the balloon to do. 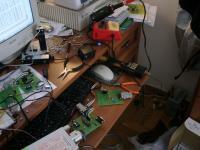 Now, there are lots of things people put in payloads, like cameras, ham radio repeaters, geiger counters, etc. For the first flight I focused on successful launch, tracking and recovery, with photos being a bonus and an eye-candy. I called the Insytut Meteorologii i Gospodarki Wodnej (Institute of Meteorology and Water Management) - the Polish National Weather Service and asked them where they get their balloons. I was redirected to the Department of Aerology in Legionowo where I was told they get balloons either from Kaymont or from another manufacturer in Japan. As the cost of shipment from Japan would be overkill, I decided to order from Kaymont. 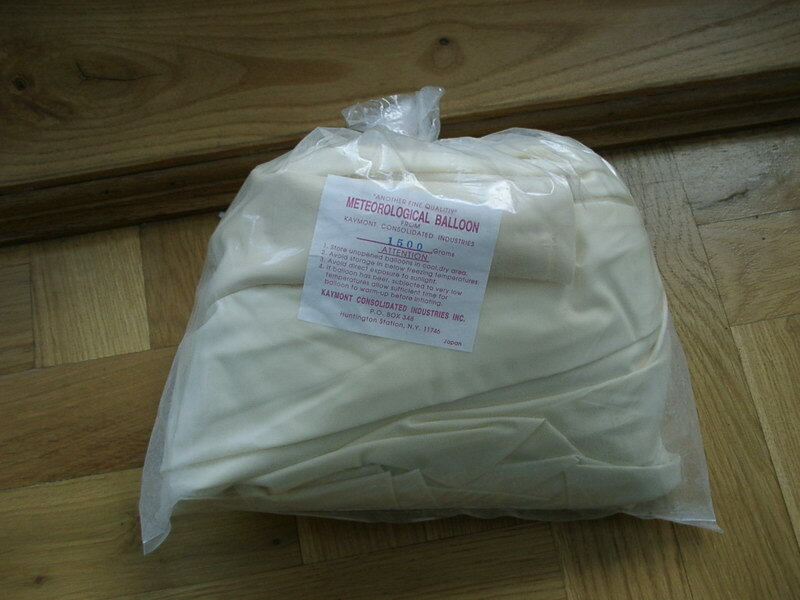 I got a 1500g sounding balloon, the KCI1500 for $90. 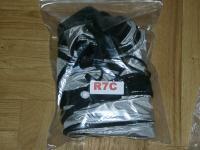 The parachute is a $46 R7C standard 8lbs rocketry chute from The Rocketman Store. Current (as of June 2006) regulations pertaining to unmanned free balloons in Poland can be found in "Dz. U. nr 414/2004". In short: as long as the payload doesn't exceed 3kg (6.5 lbs), its density doesn't exceed 13g/sq. cm and the load line breaks under no more than 230N of strength, and you get a permission - you're OK. It took me a few days to sort out all the details, as they kept redirecting me from one agency to another. Eventually I found out that the Agencja Ruchu Lotniczego - Air Traffic Agency is responsible for processing permission requests. Thanks to a very helpful person there, I got my permission in a week. They also publish a NOTAM (Notice to Airmen) to warn pilots of an upcoming balloon flight. I needed the avionics to be as lightweight and robust as possible. I had the choice between picking a commercialy available low-power device, or designing one on my own. As the project was supposed to be fun, :-) I chose the latter. I've designed the Cygnus flight computer and avionics to be microprocessor-based, highly specialized interchangeable modules, communicating by slow speed serial interfaces. The microprocessor architecture of choice is Atmel 8bit AVR RISC. The AVRs have lots of built-in features making them (in my opinion :-) superior to PICs or similar devices. They also have proven themselves robust enough to withstand harsh environmental conditions and RF interference. The FDAC contains main flight logic. It manages other modules, makes control decisions based on external/internal data and triggers execution of on-board experiments. FDAC works in real-time. It has "ears" - the GPS module, the COMM module and the EMC module, "eyes" - the down-looking and side-looking cameras and a "knife hand" - an emergency balloon cutdown device. The FDAC also controls a 80dB piezo buzzer and an ultra-bright LED beacon for optional night time recoveries. The COMM module manages communication with the balloon. 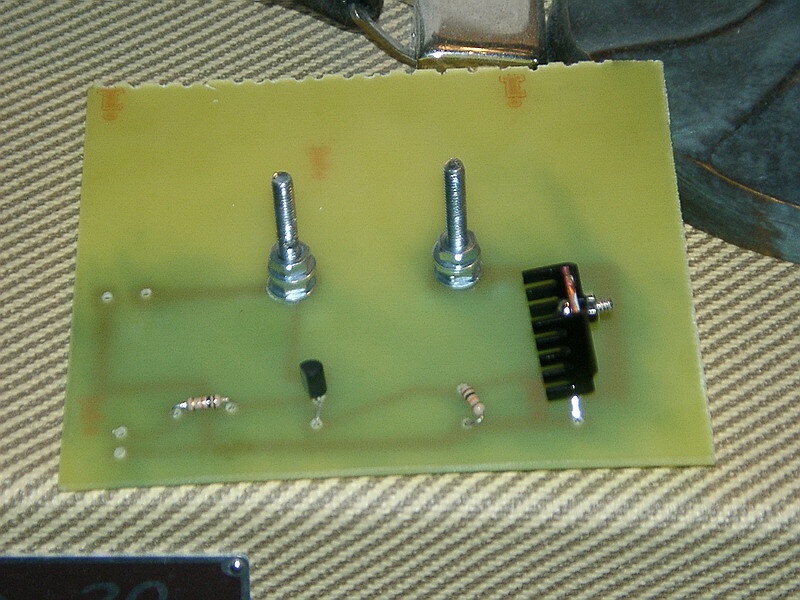 There are two systems for that: a custom-built FSK (Frequency Shift Keying modulation) modem module (based on the CML Microcircuits FX614 FSK modulator-demodulator chip) for transmitting custom-format ASCII telemetry and receiving commands; this design allows use of any radio TRX with an audio (mike) input and remote keying - from 2m amateur handheld transceivers to compact ISM band embedded radio modules, and a wide choice of antennas - j-poles, dipoles and even good quality rubber duckies, if there is such a thing. :-) I chose to go with a twin-lead j-pole, since it's easy to make, and what's important, flexible - it doesn't need a support structure. 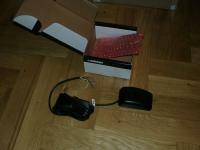 The second system is a GSM phone. There's very good network coverage in Poland, even in remote rural areas. GSM is not designed for air telephony and no base stations' sector and omni-directional antennas are "aimed" at the sky. 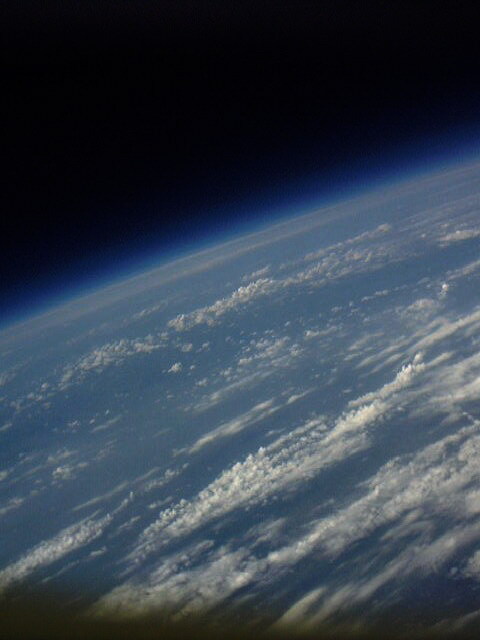 When the balloon ascends, it "sees" the horizon farther away, so communication becomes possible with distant GSM base stations, however real-life tests showed there is absolutely no GSM reception above 650m (2100ft). So it's not like in the movies! Knowing that, the GSM phone still is a useful recovery aid -- sending the landing site position via SMS messages. 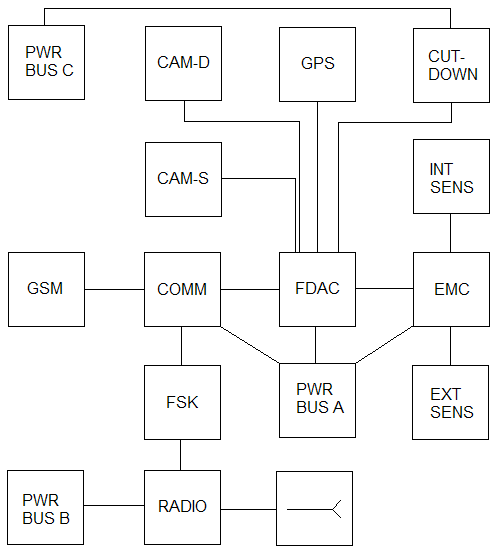 I used a Nokia 6310 phone -- it's old enough to have a pretty good RF section (though not as good as the 6110) and modern enough to use Hayes AT commands and not Nokia's proprietary FBUS protocol (which is a reall hell to program -- it took me 15+ hours to do SMS sending with FBUS, while with AT commands connecting the cable took longer than programming :-). 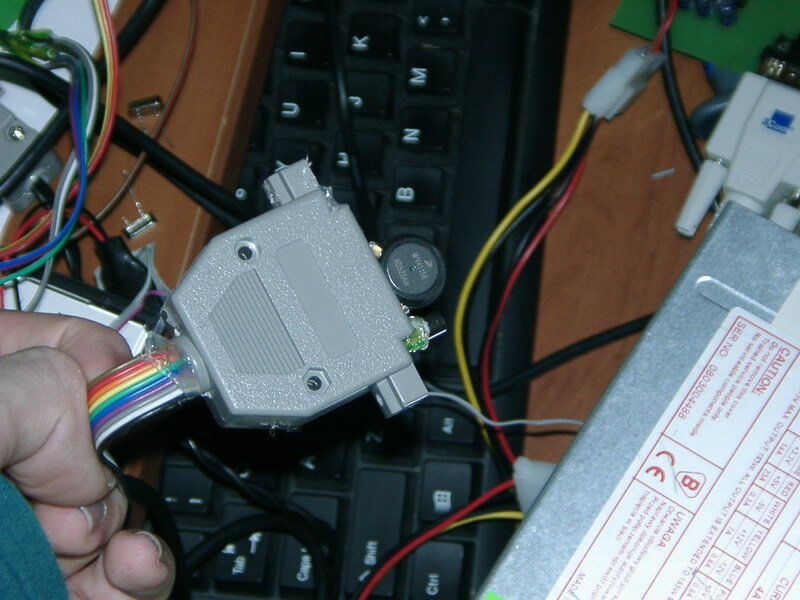 I used a Nokia DLR-3P standard serial cable to connect it to COMM module's hardware UART. 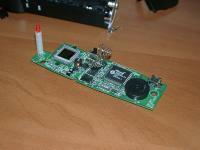 The COMM module communicates with FDAC using a 300bps serial interface. The EMC module is responsible for sampling and formatting environmental data from internal and external sensors: external temperature, external absolute air pressure, internal temperature, main battery pack temperature, radio temperature. I used Dallas (now Dallas/Maxim) DS18B20 series digital temperature sensors and a Motorola MPX series absolute pressure sensor. The Honeywell relative humidity sensor didn't make it in time, so it didn't fly. 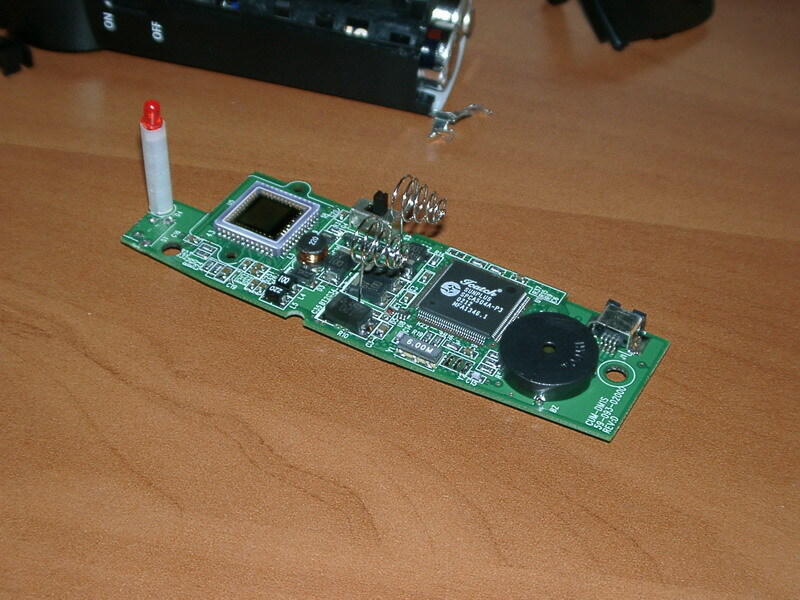 The EMC module communicates with FDAC using a 1200bps serial interface. 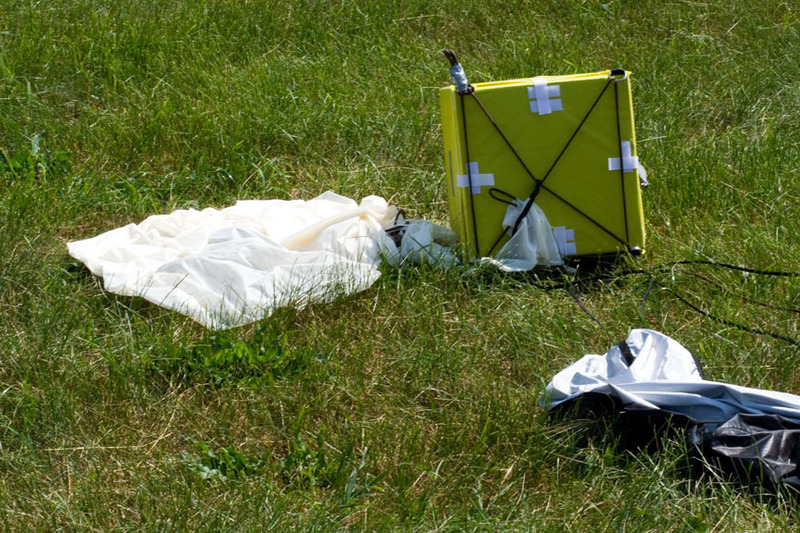 The emergency cutdown device is mounted on top of the parachute. It is a piece of NiCr (nichrome) wire tightly wound around the load line and connected to screw terminals on the PCB. Power to the wire is switched by a 10 amp MOSFET and controlled by the FDAC. The wire gets glowing hot in less than a second and melts the nylon load line, separating the balloon from the parachute and initiating descent. 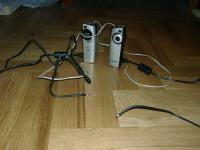 Due to high-amp loads placed by the wire, the cutdown circuit has its own small battery pack. 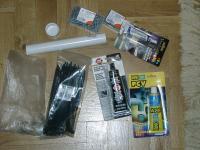 There are two reasons to actually use the cutdown: if the balloon becomes neutrally buoyant (i.e. won't ascend high enough to burst) and it stays in the air long enough to pose a threat for air traffic at night - I read it happens sometimes - rarely. The second reason is a "runaway balloon" - if it becomes obvious the balloon will travel too far from the launch site for recovery to be feasible, or will land in an inaccessible place like a swamp. I needed to know where the balloon was to record its altitude (a pressure based altimeter is not an option due to inability to calibrate it properly in an amateur lab and too low pressure at near space altitudes; a radar based altimeter is beyond amateur budget and it's too heavy) and to recover it after landing. The choice was obvious: a GPS receiver. After thorough research I decided on a $180 Garmin GPS-35 trackpack. It's not the best one around sensitivity-wise, as it's based on an old Garmin chip - no match for modern Sirf Star III receivers. It is, however, environmentally rugged, it's a complete package (receiver and antenna in one case - hence the name "trackpack"), and it's been successfully used by ballooning groups all over the world. It's also known not to have altitude restrictions as some commercial GPSes do. 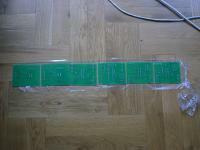 I chose a GPS-35LVS submodel. 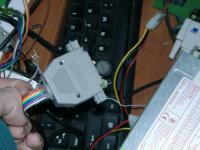 It's designed for a low voltage supply (3.6V to 6V) and outputs RS-232 levels on its two serial ports. 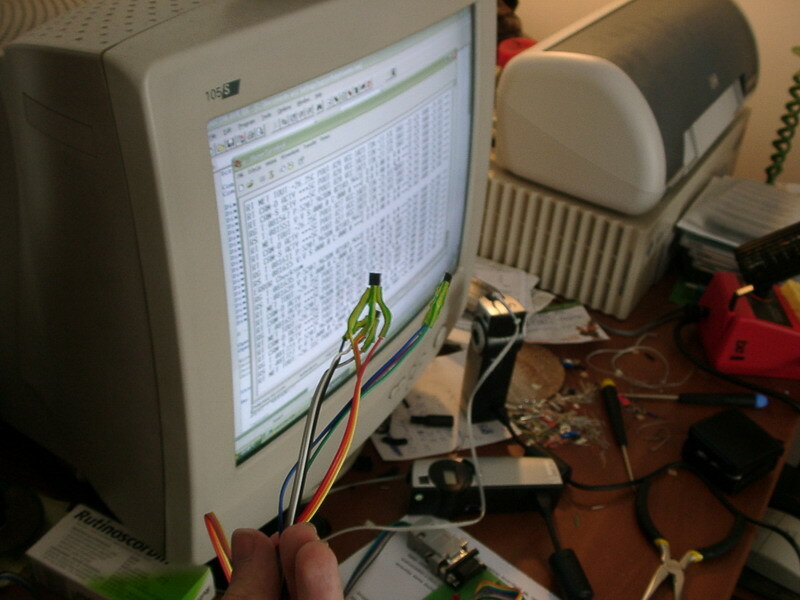 I supplied the GPS with 5V from Power Bus A and connected the first serial port (ASCII NMEA output, 4800 baud) to FDAC's hardware UART. The cameras for the first flight had to have one feature: low cost. ;-) Really, for a test flight, which I didn't even know if i was able to recover, there was no sense in using expensive multimegapixel devices. I needed two features: a way to rig the shutter pushbutton to flight computer's output and a possibility of disabling the automatic poweroff, so happily included by camera manufacturers these days. :-) Again, some heavy research was in order. I found Aiptek PenCam 1.3 Mega and got two here for $30 each - not a bargain, if you ask me. ;-) These cameras are in fact just toys, I wouldn't even use them to take a photo for the family album. They claim to have a 1.3Mpix sensor, but color quality, flaring and JPEG compression artifacts make it impossible to use the "high quality" mode. I settled for VGA (640x480) low quality mode. The cameras have 16MB of built-in flash, enough for about 190 pictures in VGA mode. They're normally powered by two AA batteries, but there's a really nice feature available: power by USB. In USB power mode, you don't have to have batteries in the tray, the on/off switch is inactive (so there's no worry about accidentaly switching it off) and what's most important, the auto poweroff is disabled. 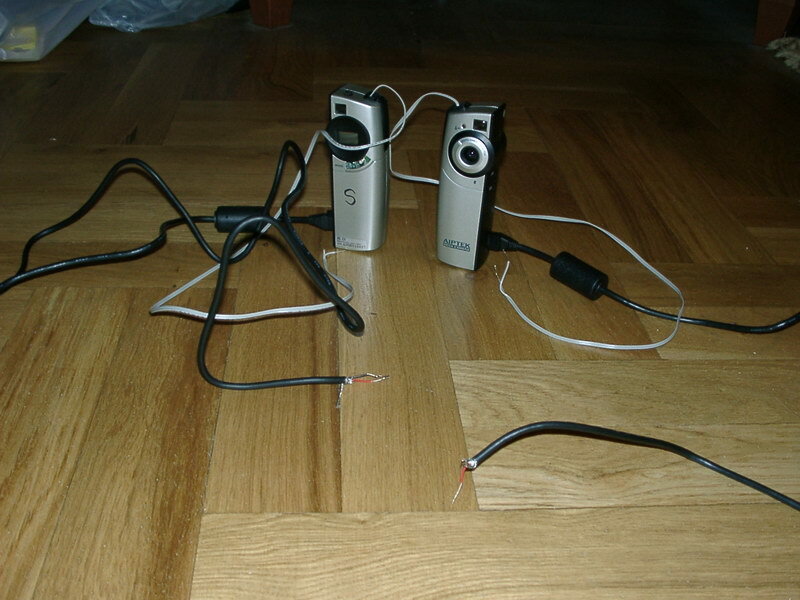 I bought an additional USB cable (for downloading pictures), cannibalized two cables that came with the cameras and connected them to 5V Power Bus A. Then, thanks to my wife (who can open pretty much everything without destroying it :-) we opened the made-in-Taiwan-plastic cases and I replaced the original shutter pushbutton with a cable. A quick test confirmed that a NPN transistor can switch the shutter. There was one more button to deal with, the mode button. I didn't want to mess with it because it was SMD and besides, I thought I might need to use it manually so I left it as it was. The cameras are unable to remember the mode they were in before poweroff, so they have to be switched to low quality mode every time. Taking into consideration the harsh operating environment, the only feasible power source are primary (non-rechargable) lithium cells. Not to be mistaken with rechargable Lithium-Ion or Lithium-Polymer batteries, lithiums are capable of operating under low or high temperatures and sourcing higher current than any commercialy available cells. Lithium cells come in two flavours. 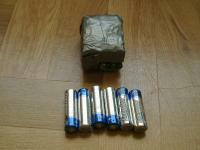 There are military surplus battery packs containing 3V lithium-manganese dioxide chemistry cells (Li/Mn O2) and consumer AA/AAA size 1.5V lithium-iron disulfide (Li/Fe S2) cells. 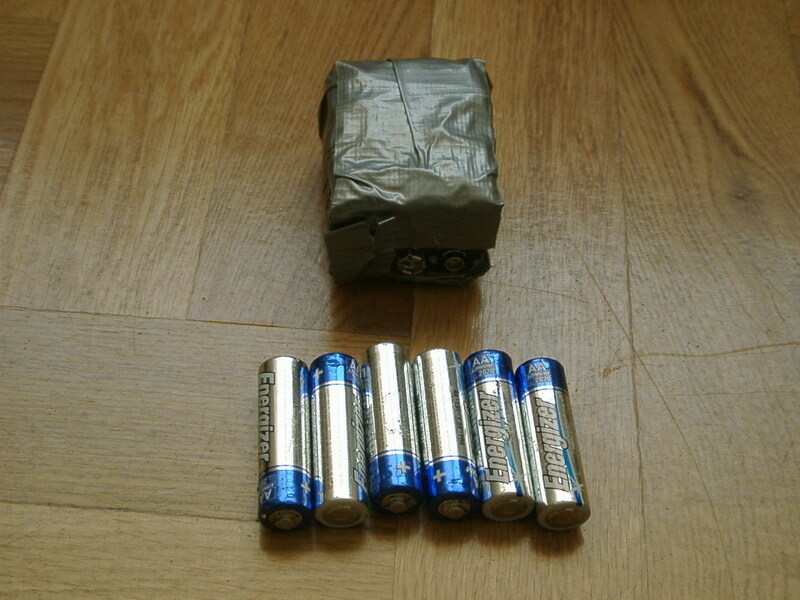 As military surplus lithiums would probably be very hard to come by in Poland, I settled for Energizer L91 AA size batteries. I got them from here, they come in packs of two for under $6. They are rated for operating temperatures from -40 to 60°C, 3000mAh capacity and 2 amps continuous drain. They're also much lighter than alkaline cells, weighing only 14.5 grams! 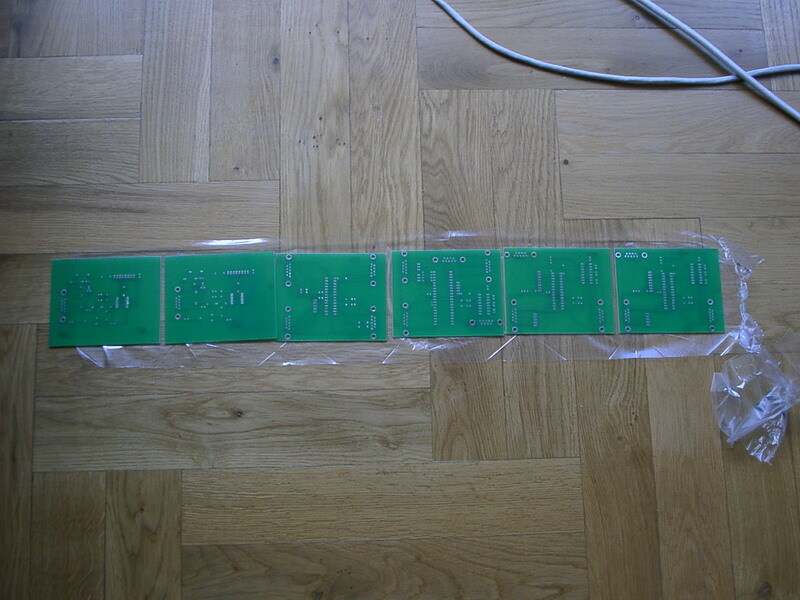 I arranged them into battery packs of six -- giving 9V, one for each of the power buses. The battery holders I ordered turned out to be of very poor quality - made of soft plastic and with tiny springs as negative terminals so even duct taping the batteries didn't do any good - one bump and there'd be a power loss. This was, of course, unacceptable. Fortunately I devised a clever makeshift way to fix the problem by putting flattened BNC connector sleeves against positive terminals, flooding the whole battery pack with hot glue and finally sealing it with duct tape. Talk about improvising! Power Bus A needed 5V, so I used a low dropout, 1A step-down converter, National Semiconductor LM2940. 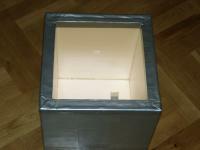 With a standard TO220 heatsink, it also served as a heater for the payload, generating about 50-60°C. Power Bus A draws exactly 500mA (including the cameras and GPS). Most of the electronics consisted of 10x8cm modules, secured with wire ties to sheets of plastic with neoprene foam as cushion. The connectors of choice were male DB9 sockets and female DB9 plugs (they are sometimes used in satellite avionics - with metal casings). I couldn't afford the added weight, so I used plastic casings. All electronic parts are industrial versions, certified to work below 0°C. I get parts from here. 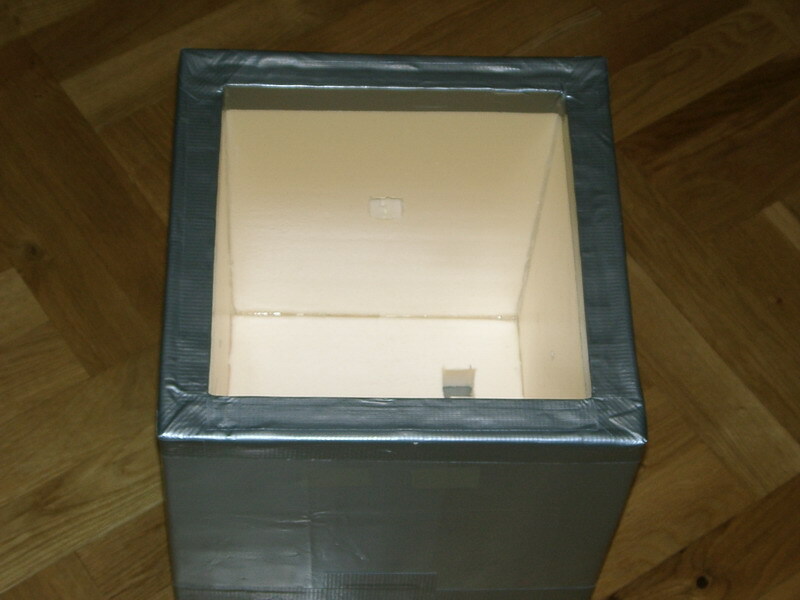 I built the payload container to be reusable and sturdy. Its main purpose is keeping the avionics warm under extreme cold at high altitudes. The walls are made of styrofoam. Now, I learned that the real Styrofoam is NOT your regular packing-grade white styrofoam. It is extruded polystyrene (XPS), used for building insulation. I found the original Dow Styrofoam to be very expensive, fortunately there are counterparts, like the Ursa XPS. I got three square meters of 3cm thick XPS here for about $15. The walls were carefully cut and hot glued together by my wife. The capsule is NOT airtight and it shouldn't be. 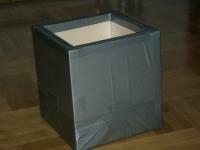 I wrapped the container in additional insulation, consisting of multiple layers of space blanket separated by nylon curtain fabric, allowing the heat generated by the payload to be reflected back inside. Most of the ballooning groups use space blankets made of aluminized mylar (NRC foil). 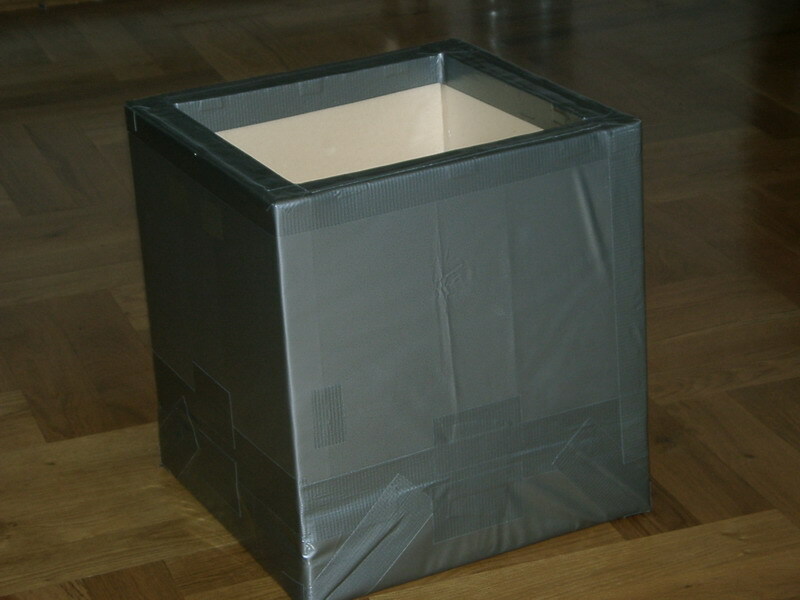 Aluminized mylar used as payload insulation has one downside: it blocks radio reception, requiring either external GPS and GSM antennas or leaving the hatch uninsulated. I was lucky to get a non-aluminized space blanket (foil), which worked just as good, but allowed me to leave the GPS inside and use the phone's built-in antenna. 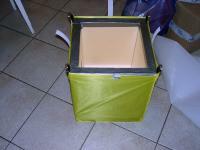 Borrowing a design from KNSP, I (again with the help of my irreplaceable wife - actually she did most of it :-) made a thin rip-stop nylon (sail cloth) jacket for the container. 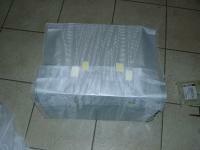 The jacket protects the space blanket insulation and secures the hatch to the box with Velcro straps. 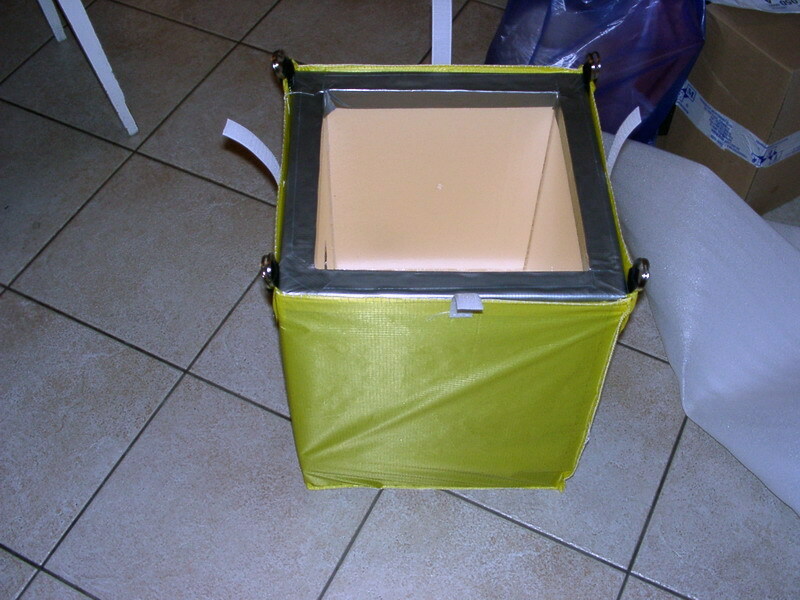 It also serves as support for the payload and parachute attachment point (four nylon straps with metal key rings are sewn into the rip-stop at the corners) A 5cm (2 inch) thick rubber foam shock absorber is glued to the bottom of the container, to ensure a soft landing. Tests revealed that thanks to the rubber foam, the capsule always recovers on its side. There are two choices of gas: helium and hydrogen. Professionals use hydrogen as it's much cheaper. Unfortunately, it's also extremely flammable and explosive. Balloons and hydrogen don't go well together - you know what I mean if you heard about the Hindenburg disaster. 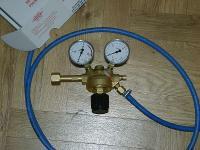 I got helium from Linde Gaz, two 5.6m3 (200 cu. ft) tanks (alas, they were out of 7m3 tanks) for $100 each. Using equations from the helium calculations spreadsheet by macfreak, I prepared a tiny but useful GNU bc script for calculating the amount of helium needed. Filling the balloon in the field confirmed the calculations were correct. I made a filler similar to the ones used by meteorologists - an industrial helium regulator I bought here for $50 and attached to it a 3 meter (10 ft) oxygen hose. On the business end, there's a 1 inch PVC cap with a hole drilled in the center. 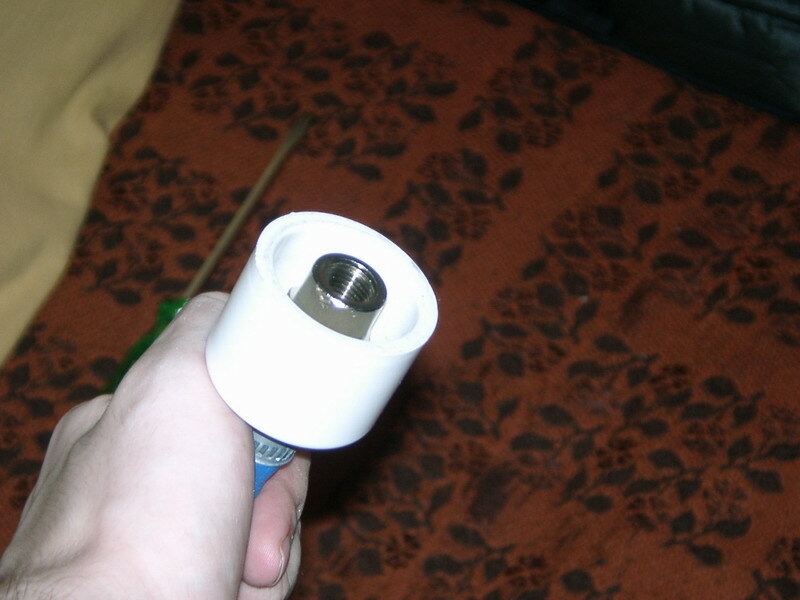 The hose has a barb at the end, and the barb is held in the PVC cap by a bushing. A 30cm length of 1 inch PVC pipe is glued with PVC glue to the PVC cap (the pipe is inserted into balloon nozzle for filling). 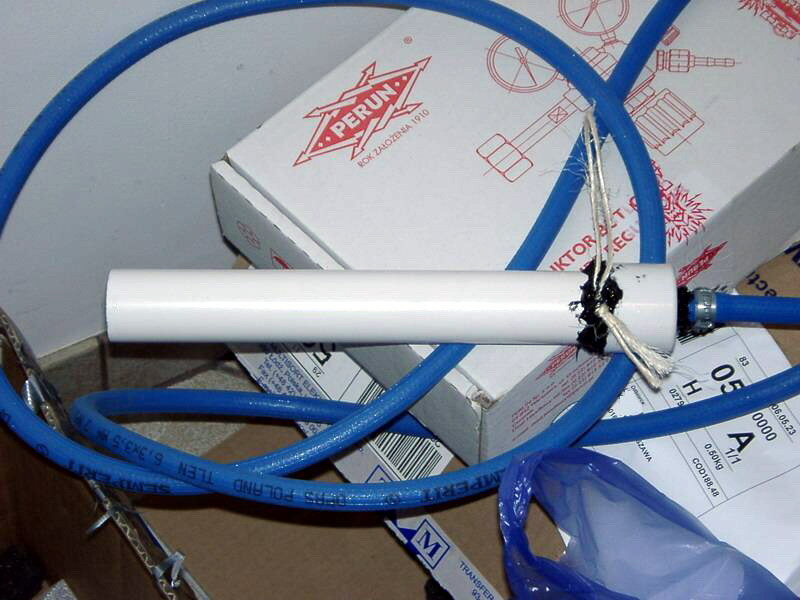 A sisal cord loop is attached to the PVC pipe for weighing the balloon lift force during filling (with a 5kg spring scale, available at fishing stores). Everything is secured with black silicone (RTV). It'd be most convenient to launch from Warsaw, or some place near the city. That, however, was not an option as the balloon would certainly pose a threat to air traffic and the payload could land on top of a skyscraper. I decided on a 150km (95 mile) radius around Warsaw. After going through the maps, ruling out swamps, forests, densely populated areas, etc. I chose a village called Dziembakowo near the town Sierpc. It's a rural area with vast plains and a few small forests. I got the permission a fortnight before the launch date, which was set for June 20th (2006). 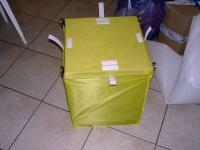 Three days before the launch we got the helium and final payload systems tests were conducted. 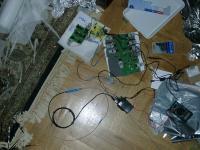 Unfortunately, the tests revealed a problem with the radio - probably a burnt final stage transistor. 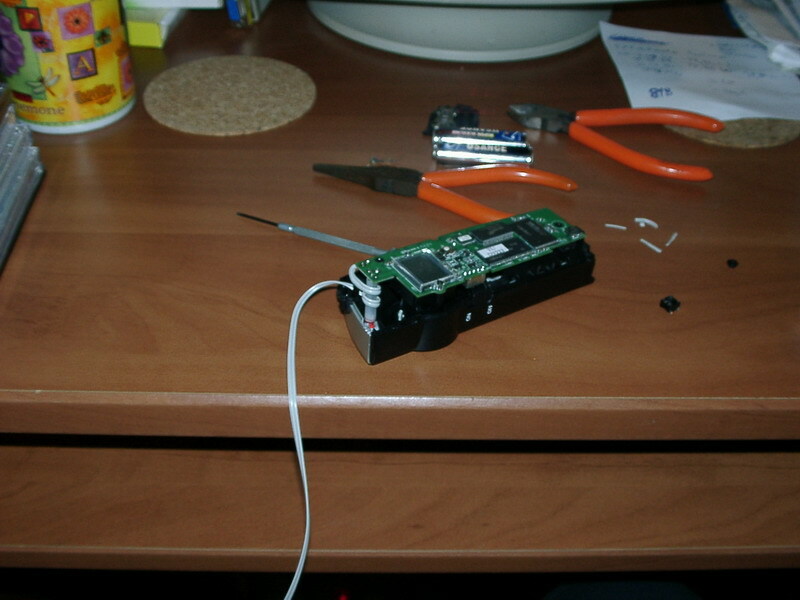 As there was no more time for diagnostics and repairs, I decided to rely on the backup GSM phone. In the evening before the launch we packed everything into the car. 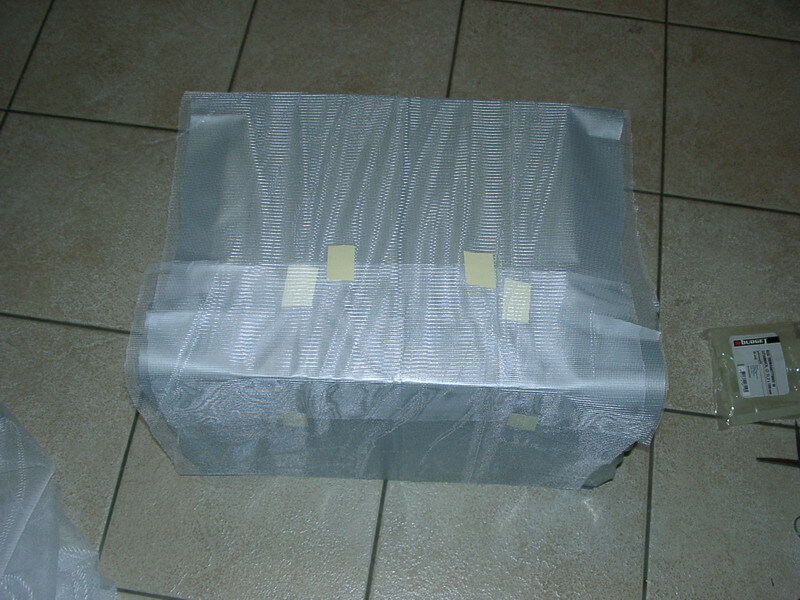 The final plugs-out test of the payload confirmed it was working fine; battery packs were sealed and secured inside. 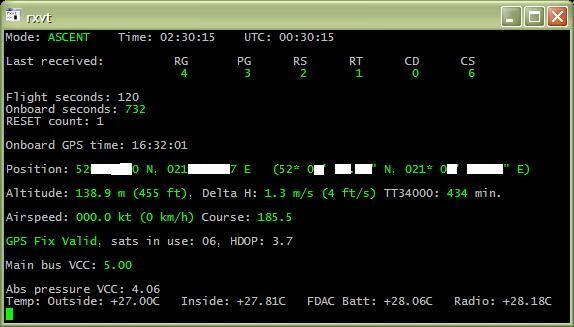 Then, after a little more than an hour and a half, I received the first SMS from the payload! All systems were still nominal, there was a solid GPS fix with as much as 10 useable satellites and the altitude of 127m AMSL confirmed that the payload has landed. I quickly put up a map on my PDA and entered the coordinates. 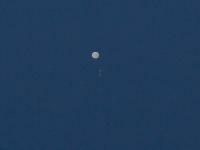 We were surprised the payload landed only 6.5km (4 miles) from the launch site. 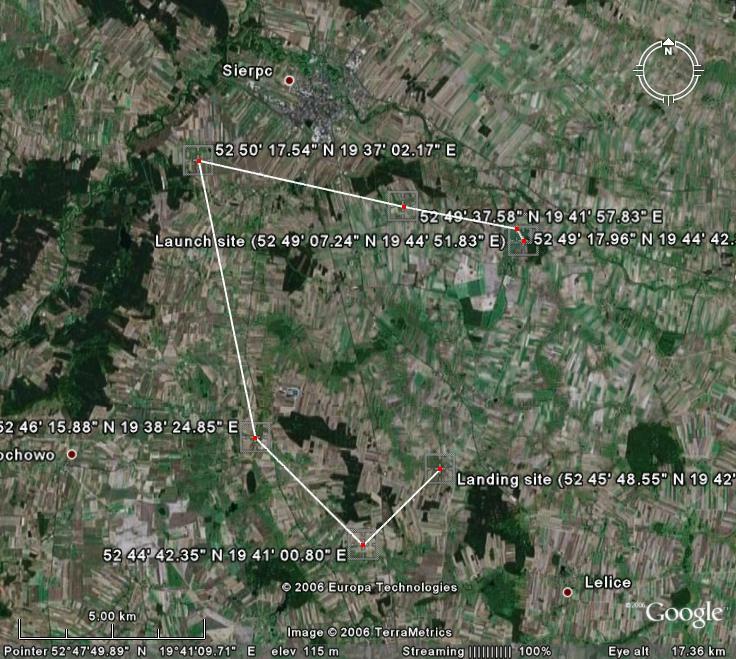 We drove there as fast as traffic law allowed :-) (fearing someone could steal the payload), got out of the car and since the payload was nowhere to be seen, I switched to navigation software on the PDA (I use BeeLineGPS) and we started to line up the latitude. 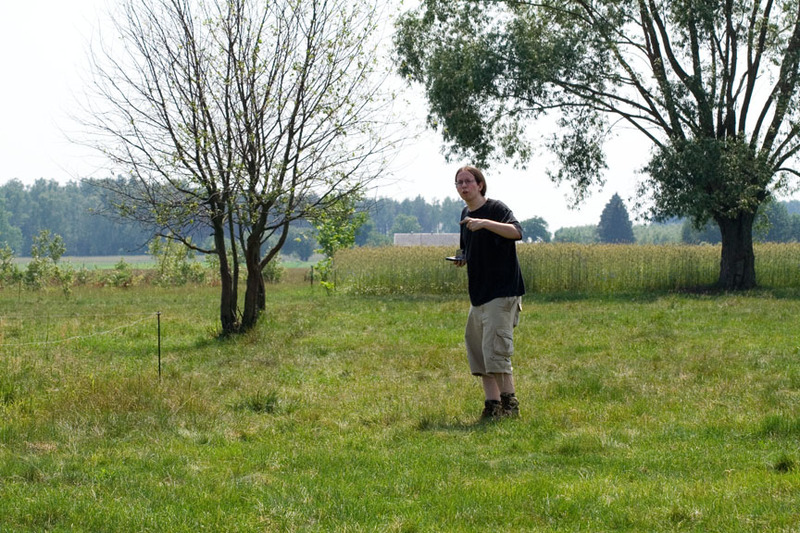 It seemed that the payload landed on the field, so we entered it and started our little cross-country survival. ;-) There were raspberries and nettles all over the place, so we got badly scratched (and, as it turned out later, even more badly sunburned). 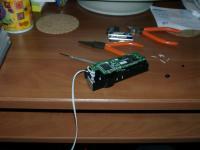 Every time we thought we were near the payload I called the phone to trigger the piezo buzzer, but we didn't hear anything. We decided to take the mathematical approach and precisely lined up the latitude and longitude. There it was! Lying on its side just about 15-20 meters from the GPS reported position. The balloon remains were still attached to the load line, and they were curled so tightly in one place, I thought I accidentally picked up a rock with the balloon envelope. We returned to the car, downloaded the pictures from both cameras and flight computer data to my laptop and shut down payload systems. Visual inspection of the payload showed no damage at all, not a scratch. Mission successful! It was time to head for home. 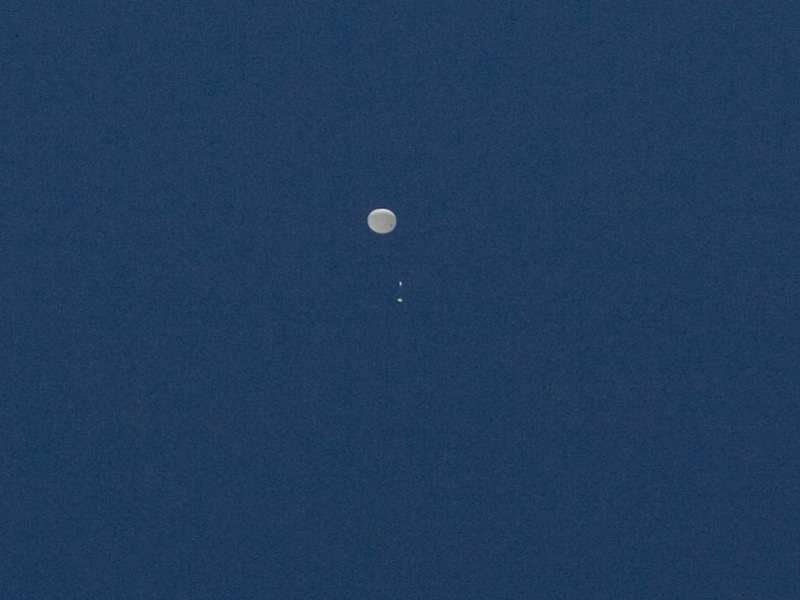 Cygnus-2 ascending There it is!